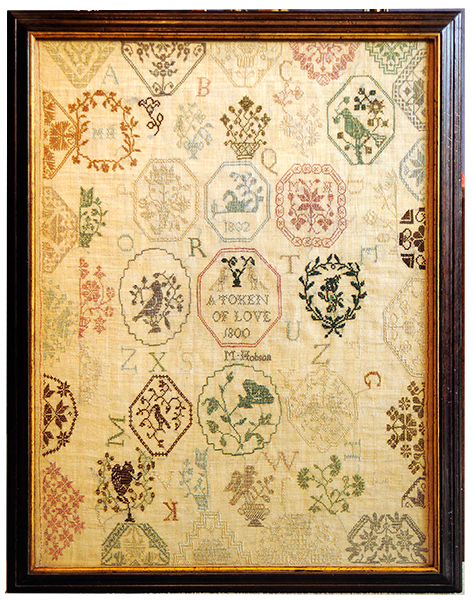 This impressive sampler bears no name but the date July 1834, the year in which it was completed. Worked with brightly coloured silks it clearly show the influence of the Berlin wool-work patterns coming from Germany which were beginning to sweep the country. Numerous small spot motifs fill the ground with dramatic swags of flowers. 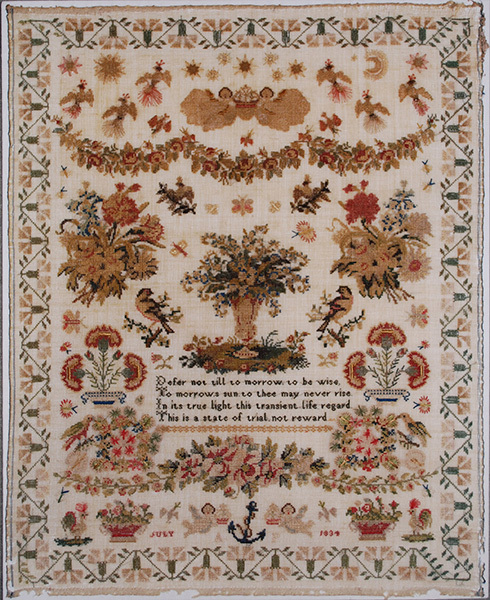 The sampler contained within a carnation border. A finely worked sampler contained within a floral border and with a painstakingly worked long, religious text, embroidered with coloured silks on loosely woven wool tammy. Such long texts illustrate the importance of female literacy evident in many mid 18th century samplers. Attitudes towards female education are reflected on samplers which were seen not only as a method of improving skill with a needle but of educating the young in the subjects of morality, religious instruction and literature. Framed Size. 15 x 14 ins. 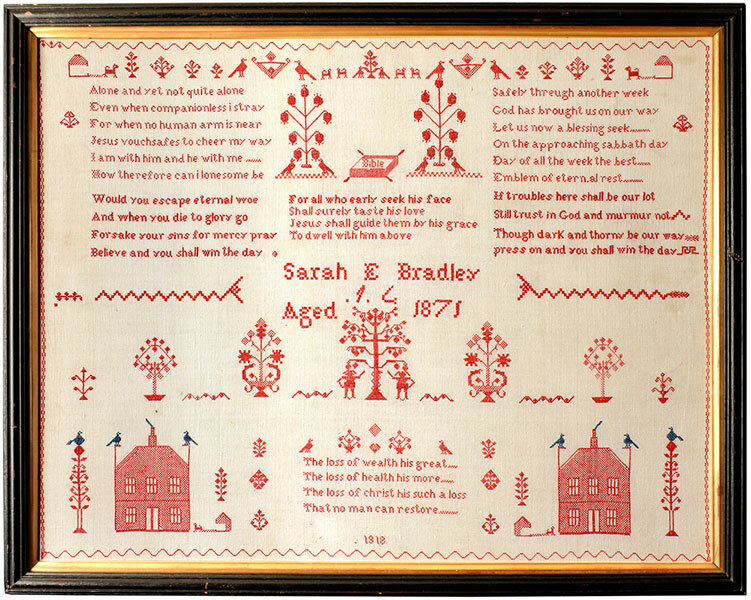 Although Sarah Bradley completed this attractive and well balanced sampler in 1871 it was clearly begun by an unrecorded hand in 1818. 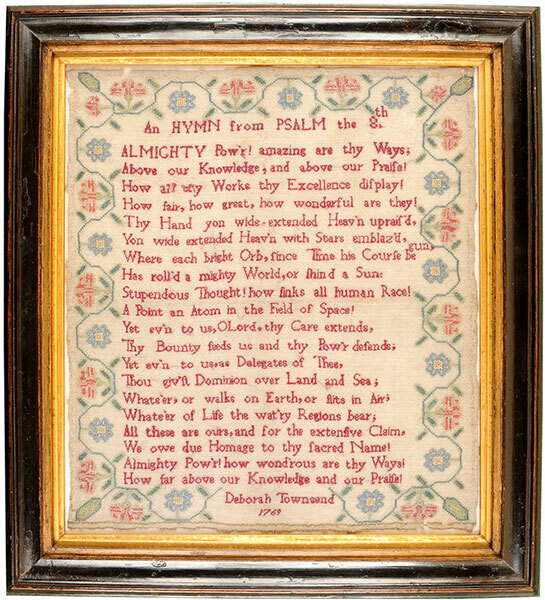 Embroidered on a cotton ground, almost entirely in red thread with a small addition of blue, the sampler has strong connections in it's design motifs with samplers worked by girls at the Muller Orphan Houses, Bristol. Framed Size: 19 x 24 ins. 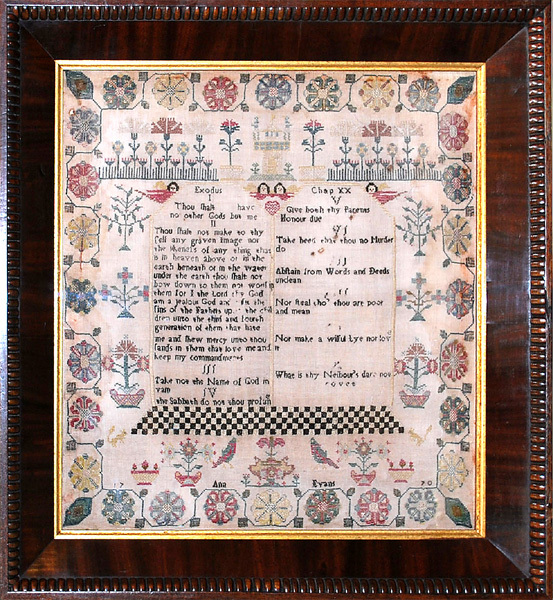 Worked in coloured silks on a linen ground the sampler uses as it's text the Ten Commandments placed above a black and white chequer-board plinth. Enclosed within an unusual border of decorative assorted flower heads with angels, birds and potted plants. Catherine Winbush Her work in the year of our Lord 1832. Finished July 26 aged 12. 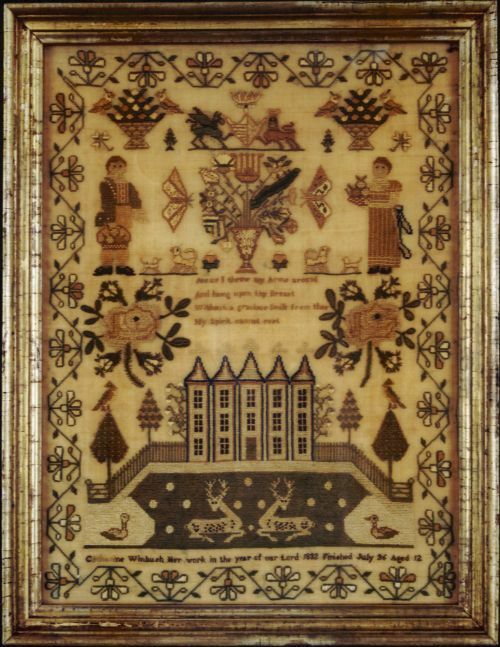 This well executed sampler is almost identical to one worked by Elizabeth Harris and illustrated in the Catalogue of Embroideries The Lady Lever Art Gallery. Page 239. 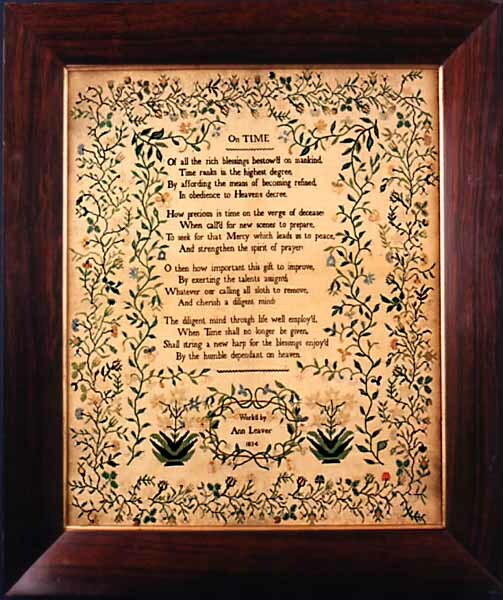 Contained in the original gift wood frame. A TOKEN OF LOVE. Attributed Ackworth School, Yorkshire. This sampler records 2 dates 1800 - 1802 these are probably the dates in which M Hobson entered and left the school Which is not named on the sampler. This is not without precedent as a number of other samplers from the school exist bearing only initials or names. Of typical medallion configuration this example is worked with multicoloured silk threads on a linen ground. 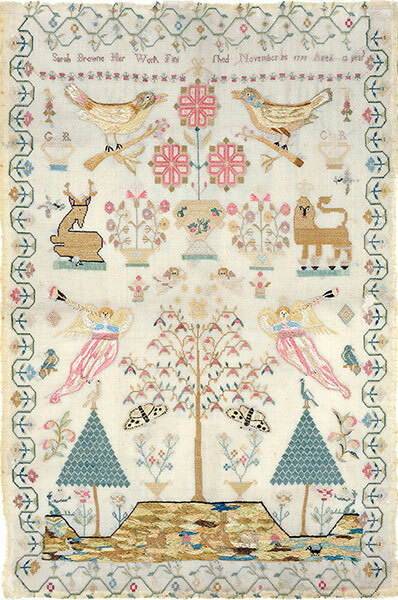 An exceptional sampler finely embroidered in coloured silks. An extravagant and freely worked floral border surrounds the meticulously stitched text. Probably worked under Quaker influence.